Are you a member of the Red Robin Red Royalty program? If you are, there are big savings to be gained this month. 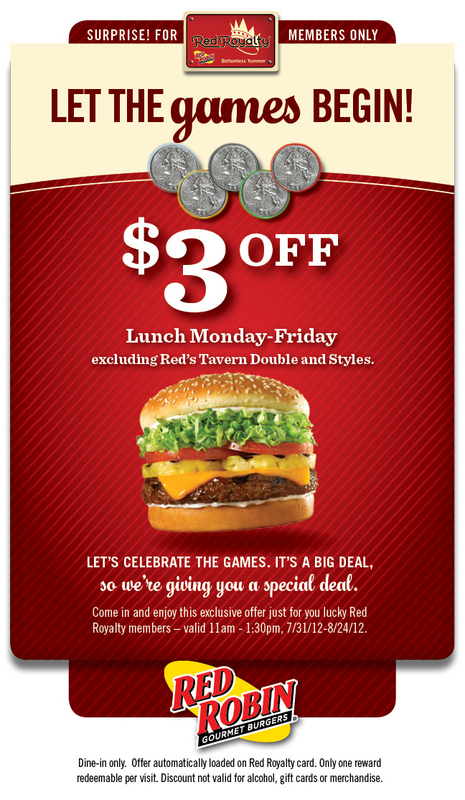 To celebrate the Olympic spirit, Red Robin will offer its loyal card members $3 off purchases 11 am through 1:30 pm, Monday-Friday until 8/24/12. This discount will be automatically loaded to your loyalty card. This offer is available for dine-in only and only one offer per table. Take the kids out to lunch before they head back to school!